Oumph! is now on the menu in The Diner at two of Butlin's resort’s. 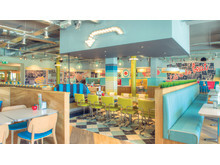 "We're pleased to see that a family focused establishment like Butlin's have chosen Oumph! to add value to their menu. No doubt this will be very welcome for the ever-increasing number of Oumph! fans among vegetarians, vegans and flexitarians", says Dave Smith, Head of UK Foodservice at Oumph! and Food for Progress. 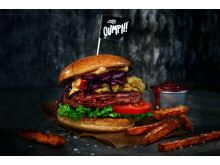 ​Thanks to the popularity of the two existing plant-based Oumph! 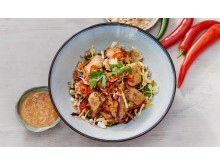 dishes at Busaba Eathai, the London eatery has added a new Thai salad with Oumph! to their vegan menu offering. The Yam Pak Crispy Soya features Oumph! The Chunk, and is mixed with crispy vegetables and mixed leaves. The peanut dressing adds crunchiness, alongside a range of spicy, sweet and sour flavours. ​Plant-based Oumph! Thyme & Garlic won Gold and The Oumph! 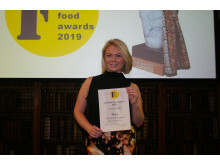 Pizza Italian Style was awarded Bronze at the FreeFrom Food Awards. Earlier this week Pulled Oumph! won first prize in no less than three categories in the prestigious World Food Innovation Awards: Best Plant-Based Product, Best Street Food Brand and Best Foodservice/Catering Product. 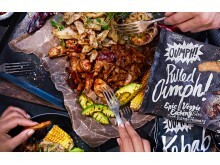 Multi award-winning plant-based Oumph! 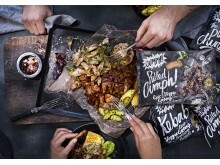 is launching in Lidl Sweden this week, where Pulled Oumph! will be a staple in the store freezers. 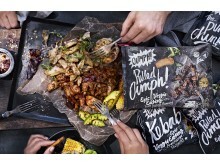 The launch kickstarts with a promotional campaign where Lidl Sweden will sell four different Oumph! products; Pulled Oumph!, Grilled Spiced, Thyme & Garlic and Kebab Spiced. ​The Oumph! Burger - Coming Soon! 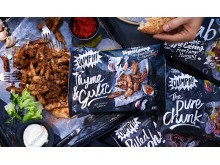 This spring, Swedish food manufacturer Food for Progress is launching The Oumph! Burger, which is a plant-based premium burger for all burger lovers. The Oumph! Burger will be sampled for the first time at the Fastfood & Café trade show in Stockholm this week. Multi award-winning plant-based Oumph! is continuing its expansion into new markets, with Tesco Ireland. Five Oumph! products are part of the initial launch: Pulled Oumph!, Kebab Spiced, The Chunk, Salty & Smoky and Oumph! Pizza Italian Style. Oumph! 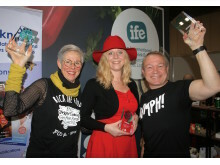 Kebab Spiced has won Best New Food Product of the Year, awarded by Food Matters Live. Oumph! 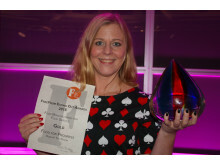 The Chunk has been awarded Gold by the FreeFrom Eating Out Awards, in the category Food For Food Service. 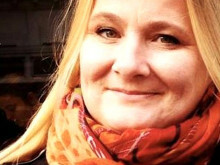 "We are excited and honoured to win two such prestigious awards", says Anna-Kajsa Lidell, Co-founder & Head of Progress Strategy at Food for Progress, the Swedish company behind Oumph! Multi award-winning plant-based Oumph! is now available in 620 Holland & Barrett stores across the UK. 4 varieties are part of the initial launch: Pulled Oumph!, Kebab Spiced, Thyme & Garlic and The Chunk. Oumph! is made from soya beans and organic herb and spice mixes, and free from gluten and dairy. It's versatile and easy to cook, which makes it suitable for home cooks as well as food services. Multi-award winning plant-based Oumph! is receiving further recognition within the global food scene, and is now a finalist with their popular Pulled Oumph! in no less than three categories in the World Food Innovation Awards. Pulled Oumph! is a finalist in the following categories: Best Foodservice/Catering Product, Best Plant-Based Product and Best Street Food Brand. The Oumph! Burger is now available at Kesko stores. Have you tried Pulled Oumph! Big Pack yet? Availible in Swedish Ica stores. YUM! Watch Vegan Life Magazine preparing some crazy good tacos. Food for Progress is driving a new food logic. We work hands on with climate, health and food security. Co-creation is our core value and global impact our goal. Our Brands: Oumph! and Beat . We will soon be 9 billion people. And we only have 1 planet. We need to eat in a way that allows us all to thrive within the planetary boundaries. But we do not do that today. What we eat today, and what we should be eating, for the sake of ourselves and the planet, are two different things. That is stupid! Our solution is action. We love co-creating with partners who want the same thing as we do. When we open up, share risk, opportunities and resources, we multiply our common leverage. For us, it is a methodology for driving innovation and sustainable growth. And maximizing impact. Our operations are structured into four divisions; Our Brands, Joint Venture, Private Label and Trading. We have two production plants, both certified by the BRC standard and for KRAV/EU Organic production. One is focused on producing a wide range of plant based foodstuff. The other is an ice cream plant, and in transition to being fully plant based. Both are situated around 100 km from Gothenburg in the west of Sweden. We work on a global scale. All partners involved are connecting strong existing networks, logistic infrastructures and market know how to enable strong local impact on each market. We see this as the foundation for reaching the common goal of One Planet Food at the right speed.